The first surfer I met in the Great Pacific Northwest was Darryl Wood. That was in February of 1979, just after half of the Hood Canal Floating Bridge, the link from the Olympic Peninsula to the rest of the world, had been ripped from its moorings in a very localized storm that included hurricane-force winds, along with a powerful tidal surge, that shift made stronger by the almost record low pressure, and waves pushed higher on the sixty mile fetch of the ancient fjord, all focused on the center of the bridge, opened to allow the pressure through, pushed open like a gate, and gone. A week later I, a person who had thought I was through with surfing, was surfing, in a diving wetsuit I had just purchased and would later give to a Gary Gregerson, a friend and fellow signpainter at the shipyard, who planned to use it for walking around in creeks. Sure. I should say I was attempting to surf at a spot you could then access, after first navigating some winding roads, by driving straight toward the Strait, past the guy who would step onto his back porch, six feet from your vehicle’s window, then pulling to the right on top of firmly in-place riprap. It was a beautiful Saturday afternoon, 38 degrees, there were three other surfers out, each of whom asked where I came from; and the water was freeeeeeeeezing. My sister Melissa’s board, the only one I hadn’t sold before leaving Mission Hills, longer than the one I had been riding, didn’t float as well with the cumbersome extra rubber, my hoodless head felt like each wave I pushed through was filled with ice cubes, my feet almost instantly went numb, the wax seemed to be as effective as rubbing the board with suntan lotion, and the waves were fast and steep. 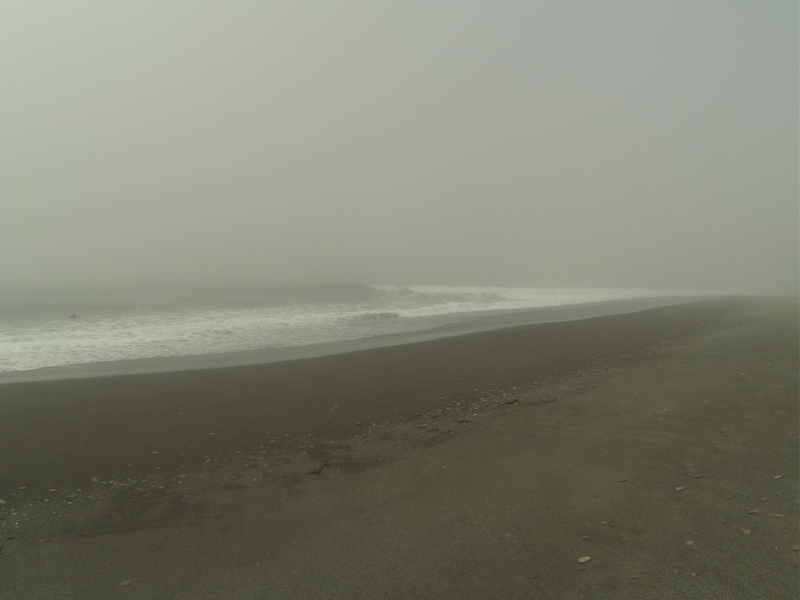 I caught several waves, couldn’t help but get barreled, and never got to my feet. Darryl Wood, with coffee cup, his longtime friend and fellow surf adventurer, Arnold, and several other members of the local Surfrider Chapter, cleaning up this parking lot just rolled over by another storm. “The more things change,” huh? “You still, um, riding most waves on your knees, Erwin?” “Well, no, I, uh… yeah, pretty much. Get a longer ride and, maybe… how are you doing?” As older guys do, and Darryl is a bit older than I am, we both talk about knees without internal padding. He added shoulders damaged from years of swinging hammers and lifting beams and such. Still, Darryl remains the surfer I most admire and respect from my tenure in the northwest. He has held, tenaciously, to his Christian values, maintained his sense of surf etiquette, and, although he considers himself quite conservative, he is able to look past the posturing and pettiness of a succession of amped-up surfers. Including me. 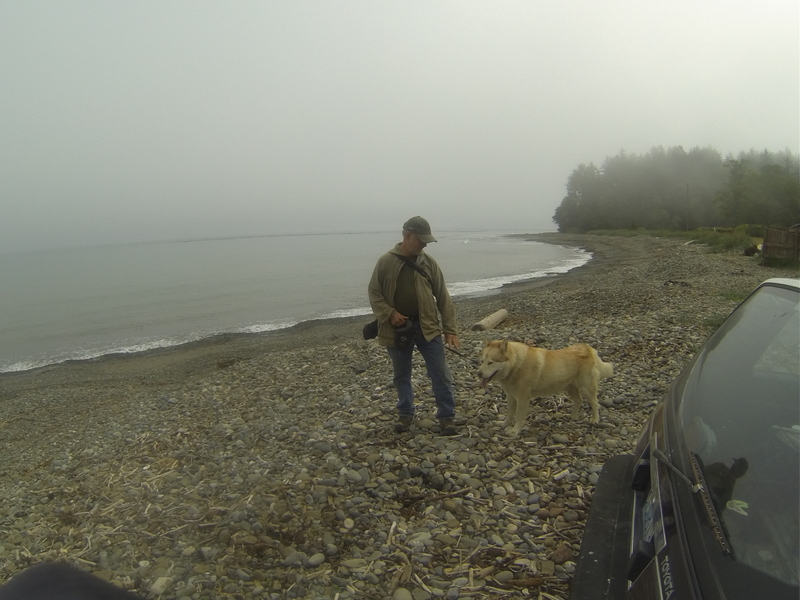 I asked what Darryl what he thinks of the increasing number of surfers hitting the Strait, so changed from the days when he personally knew most of the surfers in the area, and knew the landowners who had gates blocking access to secret spots. He shrugged. “If it’s breaking on a weekend,” he said, “there might be fifty, sixty surfers.” This wasn’t a weekend. On this same day I ran into the guy who owns this access, just checking on the storm damage. I had heard that the lot could be closed if surfers abuse the place (or when this guy passes on), and kissed-up pretty much to the limit of my ability to do so. “It’s not for overnight camping,” he said, expressing his displeasure at having, in the past, before “Darryl Wood and those Surfrider people” put the sani-can in, suddenly finding things he didn’t want to find while weed-whacking. “See you in another ten years or so,” I said as Darryl and his crew moved on to survey some other properties the Surfrider Foundation oversees. We both turned to watch my friend Keith Darrock make it most of the way across another slightly-chopped-up line. “He’s good,” Darryl said. “Yeah; always does the tuck.” “Always a pleasure,” Darryl said, taking another glance out, at the indicator, the one outside the lefts. It was breaking. He gave a nod toward the water. Always a pleasure. You may have to study this photo carefully. There are some clues. Clint, boat shop owner from Port Townsend (with cracker), is sitting in front of Tim Nolan’s car. Beyond Clint is the man I only know as Nick. Behind Nick is his son, Adam. Beyond Nick and Adam is my SUP and my car, thermos and cup on the top, the back open. Beyond that is an older model Suburban, owned by a guy named Raj. Beyond that is some surfer who got her too late, wondering where the hell the waves went; or if there had been waves at all. All will be explained. If you look a bit closer, you may discern a paddle on top of the heavily-damaged, never-repaired (partly because I still insist I’m not a dam SUPer) SUP. That would be the paddle Nick just, and this was shockingly gracious, gave me. I carry it with me when I go surfing, ready to return it to him when we next meet up. 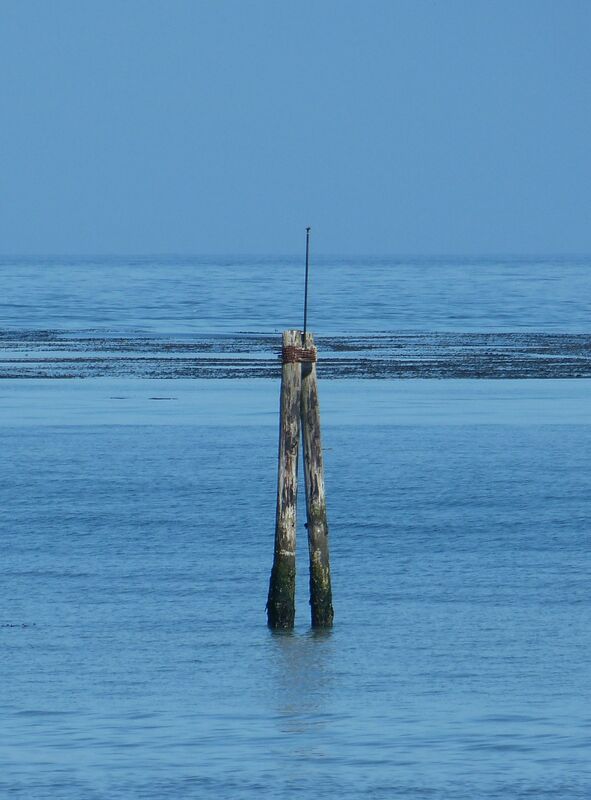 Tim Nolan may not be in this photo because he was taking a picture with his telephoto of my paddle, stuck in the wire rope holding two of the three pilings that instantly identify this spot. The surfer who performed the act/prank of grabbing a paddle I would have bailed to recover had the wave not been so good was, at this time, unknown. I should say, at that time. So, I’m actually going to write this epic mystery/saga on my zip drive (rather than here, live), so… so stay tuned. It would (to be continued). Wait, here’s a photo of Clint taken on a different day at another (secret, or, I should say ‘secret’) spot. It was taken by Adam “Wipeout” James, sent to me to gloat, originally, and, more recently, as part of the ongoing discussion of what constitutes ‘head high.’ Adam will also be a character in the upcoming mystery. So, yeah; okay, it does seem to be head high. [UH-OH, couldn’t use the shot- too much extra information]. You’ll have to take my word for it; It’s headhigh, Adam Wipeout Scale; I’d say five feet, three feet Hawaiian. These aren’t the first photos I took with the GoPro my daughter Dru bought from her friend, DJ Trentino, and gave to me; then providing extra stuff I will probably need, including a way to make the thing waterproof. Not trying that yet. Thanks, Dru. Since the site is real surfers, I figure I should have a few shots of other surfers. 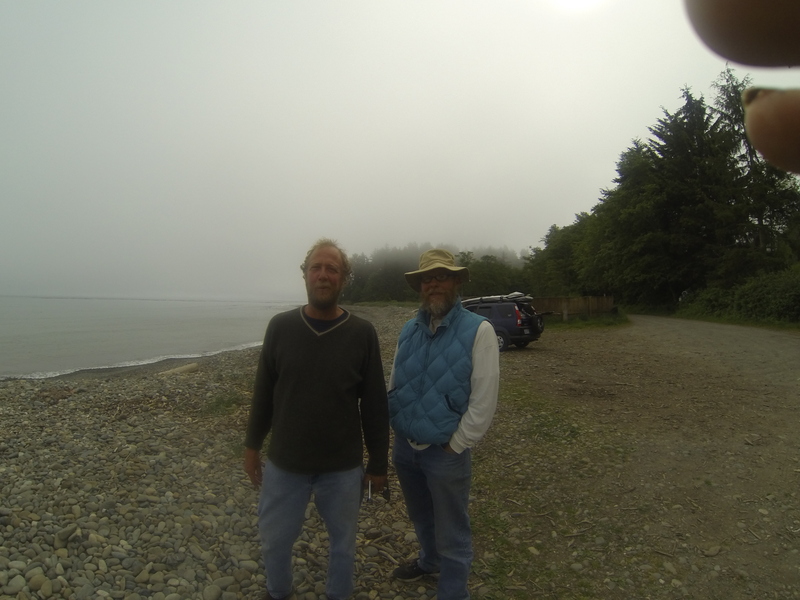 Port Townsend surfers Bob Simmons (no relation to THAT Bob Simmons) and Michael McCurdy (no relation to those PT McCurdys) out on the farther Straits. See any waves? Me either. We all headed elsewhere. 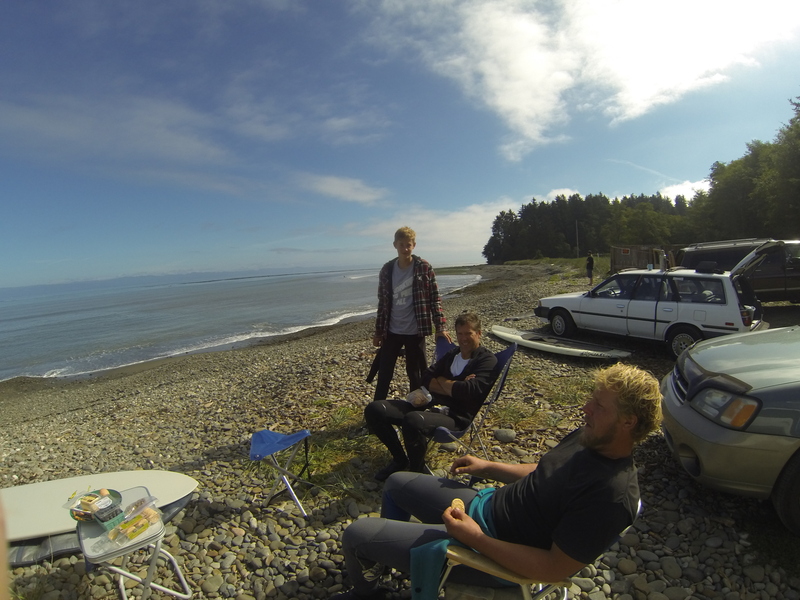 Josey Paul, one of the true locals at the same beach. Still no waves. He walks his dogs here daily, but couldn’t give me a report on recent wave activity. He said the area was once bigger than Port Angeles, center for logging, clay mining, bars, prostitutes, you know. None of them probably noticed the surf either. No, someone must have. So, I actually surfed at a backup spot, knowing the tide was all wrong, the waves would be (and were) totally closing-out. 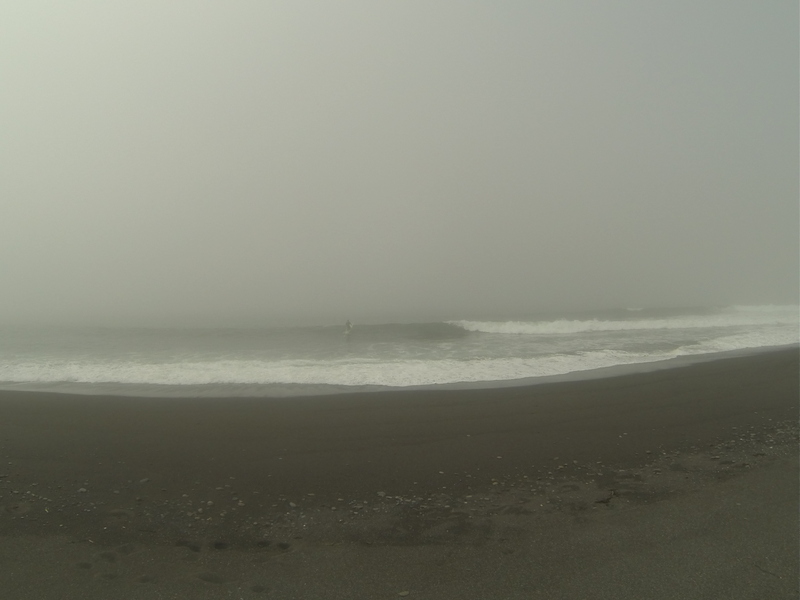 This is the third place I checked, the second I surfed. A lot of walking was involved. 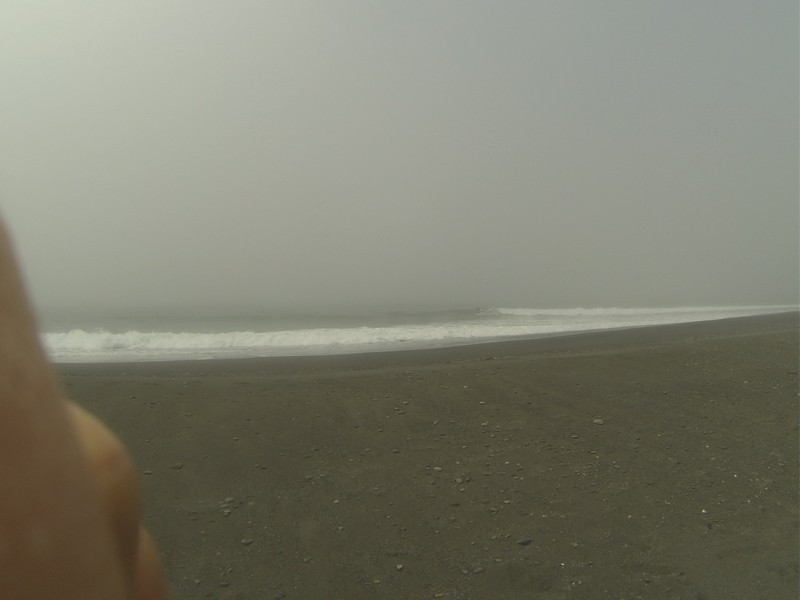 My line on this surf session is: “I wanted to surf there in the worst way; and I did.” I became intimately introduced to the gravel. Also, the guy surfing is on a ten foot board, he’s at least six feet tall; I’m saying the wave is… wait, let me look again.